Be sure to read Part 1 and Part 2 of my event recap as well! 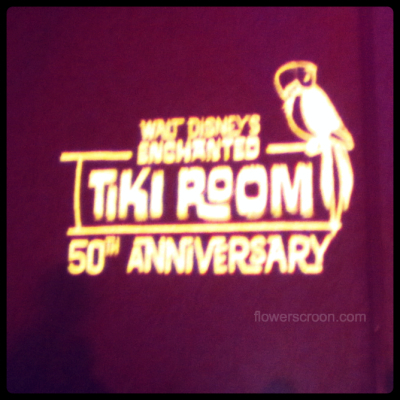 The final installment of my Enchanted Tiki Room 50th Anniversary Event Recap series details the SHAG Cocktail Party held at the Disneyland Hotel Saturday night. This event was an optional add-on to the daytime event. Well, optional for everyone else, but a mandatory once-in-50-years treat for me! The SHAG signal was lit and I found my way into the party straight away! The ballroom had been transformed into a nighttime tropical oasis complete with custom gobos, tiki themed decor and a band jamming out retro tunes. Such a fun theme! At first glance the room reminded me of the Enchantment Under the Sea dance in Back to the Future. Random reference, I know, but also a pretty great example of how my brain works. 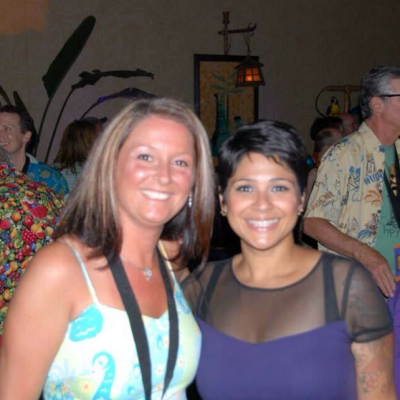 A few minutes into the event someone called my name and I was so happy to see it was Gail (@orlandotiki)! She and her husband had made the trip out from Arizona for the event. I had so much fun chatting and getting to know them both. What a fun, fun couple! 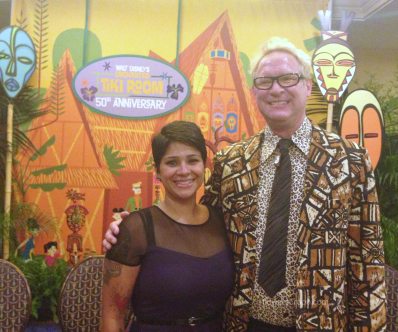 They are both huge tiki fans, tiki art collectors and both former WDW Cast Members. Love them & the great stories they shared. We enjoyed cocktails in cute tiki cups, snacked on passed hors d'oeuvres and sampled yummy desserts. Mr. Gurr continued to share stories with me and elaborated even further on the details of the Tiki Room and his time working with Walt at WED and Disney. It was fun watching him beam as I told him how much my daughter LOVES Autopia. It is truly an experience to be in his presence. We took photos together in the party room until he saw the poor quality of the photos and insisted we go out to the lobby where the lighting was better. Seriously. He left me smiling and speechless; a rare reaction from me - reserved only for the truly charming. Towards the end of the event, Cast Members called us back into the lobby in groups to pose with SHAG. After our group photo session, Gail's hubby snapped individual shots of us and SHAG. The cocktail party was fun and SHAG was a fabulous host! I can think of no better way to way to end such a fantastic event, commemorating one of the most innovative, forward-thinking attractions of its time. A true legacy to Walt's leadership and the talent of his team.